Frugal Homeschooling: Homeschooling: Take A Deep Breath - You Can Do This! 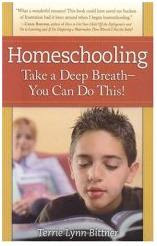 Terrie Lynn Bittner's Homeschooling: Take A Deep Breath - You Can Do This! is the book I wish someone had given me when I started homeschooling. Bittner's encouraging, practical, works-in-the-real-world advice would have been just what I needed, if the book had been available back in the days. It is almost like having all the best posts from every homeschool forum I've participated in, all wrapped up in a single cover. Science: You Mean I Have to Touch That? Visit your local library and check it out! And if you know a new homeschooling family, be kind: pick up a gently used copy and pass on a blessing! This week's free download from CurrClick is Study of Ancient Rome: A Multi-book Approach. This study on Ancient Rome covers daily life, architecture, warfare, science and technology, and much more, using both text books (or Internet research) and fiction to bring history to life. The 45-lesson course includes worksheet questions, additional writing assignments, and hands-on projects, which should help your 5-7th grade student build a deep understanding of Ancient Rome. Day lily shoots are good, too, when they're young and tender. And absolutely nothing beats Poke greens! Carnival host SuperAngel is an 18yo homeschool graduate and the oldest of 8 children. Thanks for your carnival submission and for announcing the carnival too! I enjoyed some of the ones you linked too! Hi, Miss Amanda. Thank you for stopping by! The Carnival is getting so big that it seems overwhelming to me. I hope to find time to write a post like this each week, picking out a few of my favorite entries and doing my best to give a little SEO boost to my fellow homeschool bloggers. Thanks for picking out my article as one of your favorites from this week's Carnival of Homeschooling! I appreciate your blog as well. Isn't it great that you don't have to spend $1,000 a year homeschooling each child?